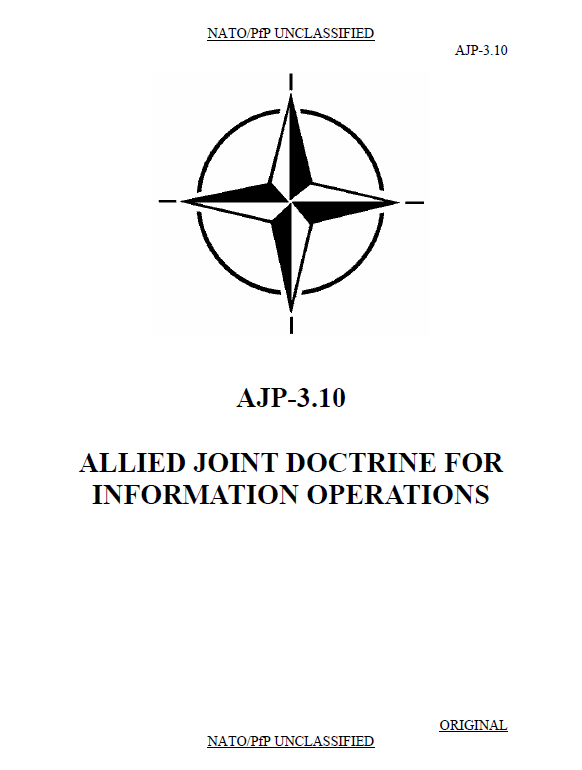 The following is NATO’s standard doctrine for information operations. Though unclassified, NATO doctrine documents are not released to the public. Information in the Global Security Environment. The changing global security situation has seen a shift in emphasis from the certainties of super-power confrontation towards more complex interactions of state and non-state actors. Globalisation, competition for resources and tensions in political and social structures combine with ideological, religious and cultural distinctions to increase uncertainty. Furthermore, terrorism, along with the spread of weapons of mass destruction, are likely to remain principal threats. There is also an expectation in some societies, reinforced by media exposure of global issues, that conflict and confrontation will be constrained by increasingly moral codes and regulated by progressively more extensive legal obligations. Concurrently, there has been an ‘information revolution’ (the Internet and mobile telephones) that has ushered in an age of computer-based decision-making. This evolving Information Environment1 comprises information, actors and systems that enable the use of information. The actors include leaders, decision-makers, individuals, and organizations. Information systems2 include the materials and systems employed to collect, apply, or disseminate information. The information environment itself is where humans and automated systems observe, orientate, decide and act upon information, and is therefore the principal environment of decision-making. To address both the changing global security situation and the emergence of a new information environment, NATO is in the process of developing concepts, processes and doctrine, including Information Operations (Info Ops), to deal with these new challenges. Non-Lethal Activities. While Information Objectives may be accomplished through lethal or non-lethal means, there is likely to be an increased focus on non-lethal activity. A large element of Info Ops is non-lethal and recent operations have shown its significance by increasing the commander’s choice of means, by which effects can be created or generated at all stages of a crisis to support achievement of objectives. Increased attention on Info Ops is also due to the realisation that we now live in an information-dominated environment as described in paragraph 0101. There is an increased reliance on, and desire for, information. In addition, the impact of real-time media coverage of crises, the exploitation and manipulation of the media by some parties and the ever-increasing use of technologies such as the Internet have resulted in a world where information plays an increasingly important role. The Impact of the Media. All crises occur under the spotlight of the international media. The maintenance of understanding and support of public opinion is crucial for democratically accountable governments, and this influences the options they can take, including military action, and the presentation of these options to different audiences. In order to gain and maintain public support, national governments and international organisations/agencies need to show a degree of transparency in their actions, and these actions must be in accordance with international law. The influence of the media has increased as access to regional and international media has increased. This has been brought about by technologies such as satellite broadcasting and global connectivity through the Internet. In addition, the availability of relatively cheap printing and copying equipment has brought newspapers and other printed material to a much wider audience. Consequently, there is a need to be proactive in ensuring that the presentation of NATO actions is accurate and reflects NATO’s messages, while at the same time countering an adversary’s or detractor’s attempts to undermine public support. a. Information activities that focus on changing, influencing, or reinforcing perceptions and attitudes of adversaries and other NAC approved parties. b. Information activities that focus on preserving and protecting Alliance freedom of manoeuvre in the information environment by defending the data and information that supports Alliance decision-makers and decision-making processes. c. Information activities that focus on countering command functions and capabilities, by affecting the data and information that support adversaries and other NAC approved parties, and are used in command and control, intelligence, surveillance and target acquisition, and weapon systems. While information operations focussing on preserving and protecting Alliance freedom of manoeuvre in the information environment should take place at all times, information operations activities focussed on influence (paragraph 0119 a) and counter command (paragraph 0119 c) may only take place as part of an OPLAN and thus with NAC approval, including definition by the NAC of adversaries and potential adversaries.